The DualMiner USB Scrypt ASICs need a special modified version of cgminer to support them. The officially provided software includes a GUI as a frontend for a modified version cgminer 3.1.1. Below you can download the modified version of cgminer 3.1.1 for windows that you can use for mining Scrypt crypto coins with the DualMiner USB Scrypt ASICs that are based on Gridseed’s GridChip GC3355 dual LTC and BTC mining processors. The modified version of cgminer 3.1.1 is designed to work with the device in both BTC and LTC mode or only in LTC mode – check the included .BAT files for each mode and make sure you have set the device to the right mining mode first using the hardware dip switch. Blakecoin (BLC) is an interesting new alternative crypto coin that uses Blake-256 algorithm – faster than Scrypt, SHA-256 and Keccak, making it an interesting new coin to mine if you have some spare resources. The Blake-256 algorithm hashrate is about 3x faster than what you are getting from the same hardware mining for Bitcoin. 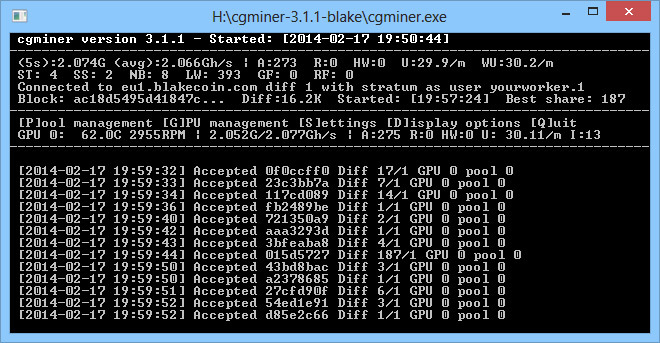 So for example with a Radeon R9 280X you can expect to get a hashrate of about 2-2.5 GH/s or more when mining Blackecoin. You cannot use the standard cgminer for mining BLC, you need to use a special version of cgminer modified for mining Blakecoin, and you can download the windows version of cgminer 3.1.1 for Blakecoin mining below.